A new selective molecularly imprinted polymer has been prepared and used for extraction in on-line SPE-HPLC to achieve the selective determination of citrinin. Four different imprinted polymers varying in combinations of components were prepared by bulk polymerization and evaluated in terms of binding capacity and selectivity. Imprinted polymer prepared from a mixture comprising 1-hydoxy-2-naphtoic acid as the template molecule, acrylamide as the structural monomer, ethylene dimethacrylate as the cross-linker (in a molar ratio of 1:4:16), and acetonitrile as the porogenic solvent exhibited the best properties. The selectivity of this sorbent was confirmed by comparison with the non-imprinted counterpart prepared using the same polymerization carried out in the absence of template. Imprinted polymer was packed in a 20 × 3 mm i.d. steel cartridge and coupled to the on-line SPE-HPLC system through a six-port switching valve. The method for determination of citrinin including the on-line extraction step was then developed and validated. The sample in the form of methanolic extract was loaded, cleaned, and preconcentrated in the imprinted SPE cartridge. 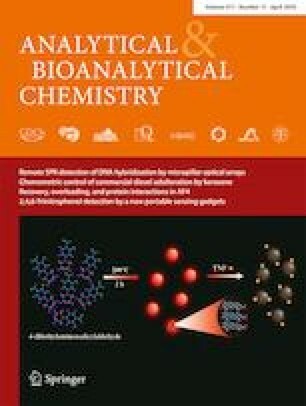 Subsequent separation of citrinin from residual interferences was achieved using the analytical column Kinetex Biphenyl 100 × 4.6 mm i.d., 5 μm particle size, and fluorescence detection (Ex 335, Em 500 nm). The total analysis time was only 9.50 min. Our fully validated method was also applied to analysis of food supplements based on red yeast rice extracts, the control of which is implemented in European legislation. Only minor yet acceptable contamination was found in tested samples. The online version of this article ( https://doi.org/10.1007/s00216-019-01682-9) contains supplementary material, which is available to authorized users. Special thanks are given to P. Kejzlar and J. Hlavatá (Technical University of Liberec, Institute for Nanomaterials, Advanced Technology and Innovation, Department of the Preparation and Analysis of Nanostructures) for providing SEM scans. This work was supported by the Charles University Grant Agency, project no. 726 316. I. Lhotská received a financial support from the project of specific research of Charles University, project no. SVV 260 412. A. Machyňáková and K. Hroboňová received a financial support from Slovak Research and Development Agency with contract no. APVV-15-0355. This work was also supported by the EFSA-CDN project (no. CZ.02.1.01/0.0/0.0/16_019/0000841) co-funded by ERDF. Liu Y, Wang H, Yao S, Zhu P. Detection of trace amounts of citrinin in dried orange peel by using an optimized extraction method coupled with ultra-performance liquid-chromatography-tandem mass spectrometry. Biomed Chromatogr. 2018. https://doi.org/10.1002/bmc.4237.